Danish (Danish: Dansk) is the main language of Denmark, and in total is spoken by about six million people. Danish is principally spoken in Denmark itself, but there are also Danish speakers in Greenland (where about 15% to 20% of the population speak Danish as their primary language), in South Schleswig in northern Germany (where Danish holds minority language status), as well as a number of Danish-speaking communities in the United States, Canada, and Argentina. Danish is a north Germanic language, and is is largely mutually intelligible with Norwegian, and Swedish. Rosetta Stone Homeschool features a foreign language curriculum specifically designed to provide homeschool students with a rich, fully interactive and engaging language-learning experience, while giving parents the tools and resources needed to manage student progress without extensive planning or supervision. Rosetta Stone Homeschool is self-paced and designed to make it easy for parents to offer language learning even if they don't speak the language their students are studying. Students are instantly captivated by Rosetta Stone so they stay engaged. Plus, with positive reinforcement and quick results, their language-learning confidence soars! This course includes Lessons 1-10 from the Danish Level 1 program - 5 hours of audio-only effective language learning with real-life spoken practice sessions. Get a chance to test drive the incredibly effective and efficient, world-famous Pimsleur Level 1 Program. Each lesson provides 30 minutes of spoken language practice, with an introductory conversation, and new vocabulary and structures. Detailed instructions enable you to understand and participate in the conversation. Practice for vocabulary introduced in previous lessons is included in each lesson. The emphasis is on pronunciation and comprehension, and on learning to speak Danish. The smallest of the Scandinavian countries, Denmark is made up of a peninsula (Jutland) attached to northern Germany, and a collection of islands known as the Danish Archipelago. Modern spoken Danish has gained a reputation as being exceptional and difficult for foreigners to understand and master. The nine Danish vowels represent sixteen different sounds and most of the consonants are unvoiced. A unique feature is the 'stod', the glottal stop, used to distinguish between several homonyms and words. The Danes also tend to drop inflectional endings, and this perceived mumbling, even in formal standard Danish, may present problems to those learning the language. The audio CDs emphasise pronunciation and address these issues in a series of engaging exercises on greetings, family, athletics, dining, illness, holidays and celebrations. Perfect for both classroom and independent students, the book also contains lessons on grammar, a glossary of vocabulary words, and a thorough introduction to Danish history and culture. Are you looking for unconventional ways to speed up the process of learning Danish? Then this book is exactly what you are looking for. Following the Pareto principle (80/20 rule), this book is built to streamline the learning process by concentrating on the core words and sentence structures that make up everyday conversations. The result is a unique vocabulary book with 2000 of the most important Danish words and phrases ordered by their frequency of use. 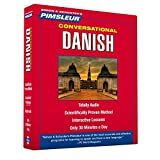 This book is for beginners and intermediate learners of Danish who are self-motivated and willing to spend 15 to 20 minutes a day on learning vocabularies. The simple structure of this vocabulary book is the result of taking all unnecessary things out allowing the learning effort to solely be spent on the parts that help you make the biggest progress in the shortest amount of time. If you are willing to put in 20 minutes of learning every day, this book is very likely the single best investment you can make if you are at a beginner or intermediate level. You will be amazed at the speed of progress within a matter of just weeks of daily practice. This book is not for you if you are an advanced learner of Danish. In this case, please go to our website or search for our Danish vocabulary book which comes with more vocabularies and is grouped by topic which is ideal for advanced learners who want to improve their language capabilities in certain fields. 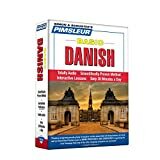 Furthermore, if you are looking for an all in one Danish learning book that guides you through the various steps of learning Danish, this book is most likely also not what you are looking for. This book contains vocabularies only and we expect buyers to learn things like grammar and pronunciation either from other sources or through language courses. The strength of this book is its focus on quick acquisition of core vocabularies which comes at the expense of information many people might expect in a conventional language learning book. Please be aware of this when making the purchase. This book is ideally used on a daily basis, reviewing a set number of pages in each session. The book is split into sections of 25 vocabularies which allows you to step by step progress through the book. Let’s for example say you are currently reviewing vocabularies 101 to 200. Once you know vocabularies 101 to 125 very well, you can start learning vocabularies 201 to 225 and on the next day skip 101-125 and continue reviewing vocabularies 126 to 225. This way, step by step, you will work your way through the book and your language skills will jump with each page you master. Danish For Children: A Special Danish Language For Beginners Book (The Easy Way To Learn Danish Language) Volume 1! Welcome to this simple English to Danish for beginners book. You will agree with me that it is always better to go from the known to the unknown. Therefore, in this book, you will learn about numbers, colors, shapes, days of the week, parts of the body and more in Danish language. Learning Danish language has never been so easy...just try this simple book out. Thanks for your interest in this small book. Now go ahead, get a copy for your kid! Do you want to learn Danish with original Danish stories? It's easy with Danish and interlinear English. 90+ pages with every word translated so you can keep on reading. This book contains short stories from Danish author Hans Christian Anderson. We have added an interlinear translation to the Danish text. This means that the meaning of every Danish word is immediately accessible, which in turn will make it much easier for you to expand your Danish vocabulary fast. Also check out our interlinear French, German, Russian, Spanish or many other languages that we have provided with interlinear translation! Use the following method to attain new Danish vocabulary and learn the Danish language while reading. Read the stories and re-read them until you know almost all the words. This is a fast process because there's no lookup time. Then focus on the remaining words that you still don't know by marking those in the text, for example. Because of the literal and idiomatic interlinear text this is the fastest method to learn to read Danish.